Sometimes, I'll do my artwork in a draw, or sign program. That allows me to help the customer visualize, what the finished product will look like. It's also very helpful, in that, it's very easy to change colors, try different combinations, pinstripes, drop shadows,etc. 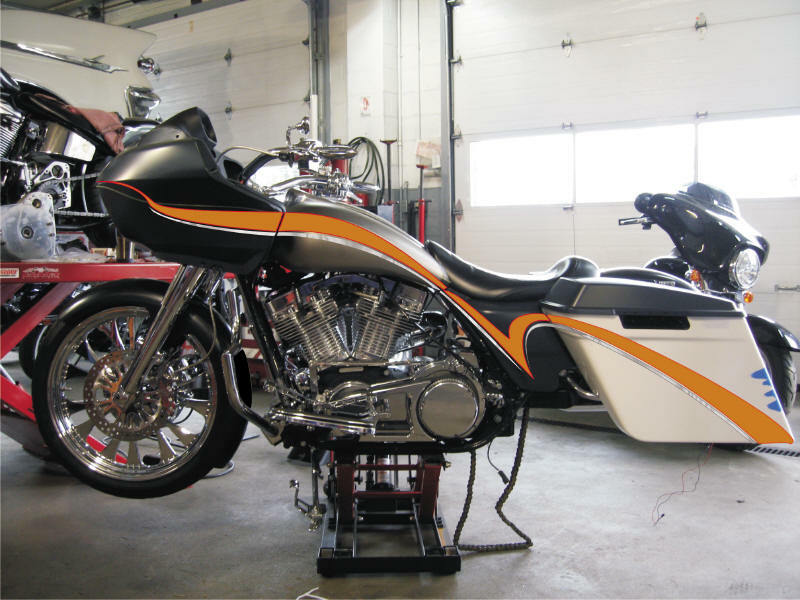 First I start with a photo of the bike, in this case, we were able to have it already assembled with the pieces that we were gonna' be using. 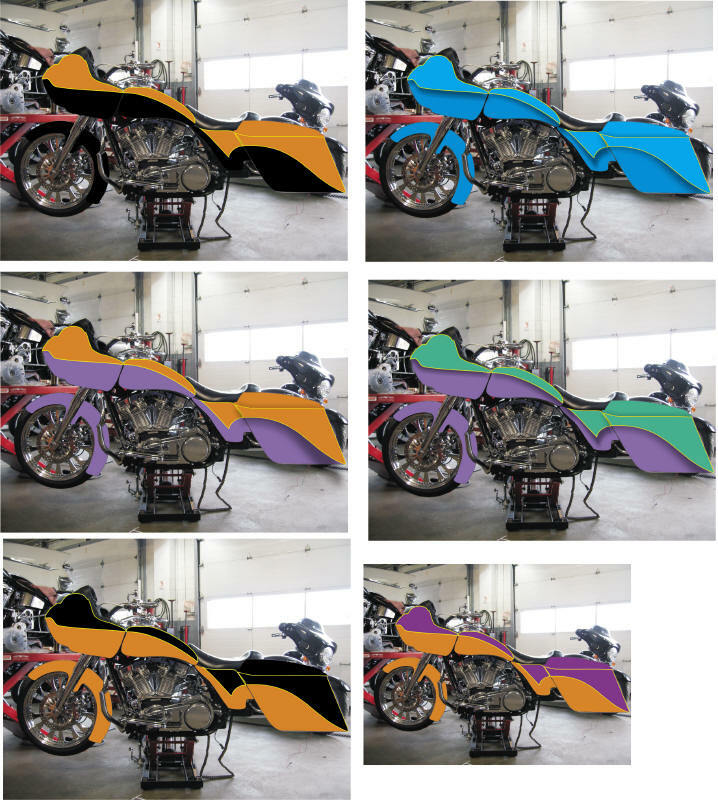 Next I worked up a line, that would flow through the bike, taking your eye from one panel, to the next. We want attention brought to them, because each one has been changed from original, and each panel also, creates the flow. 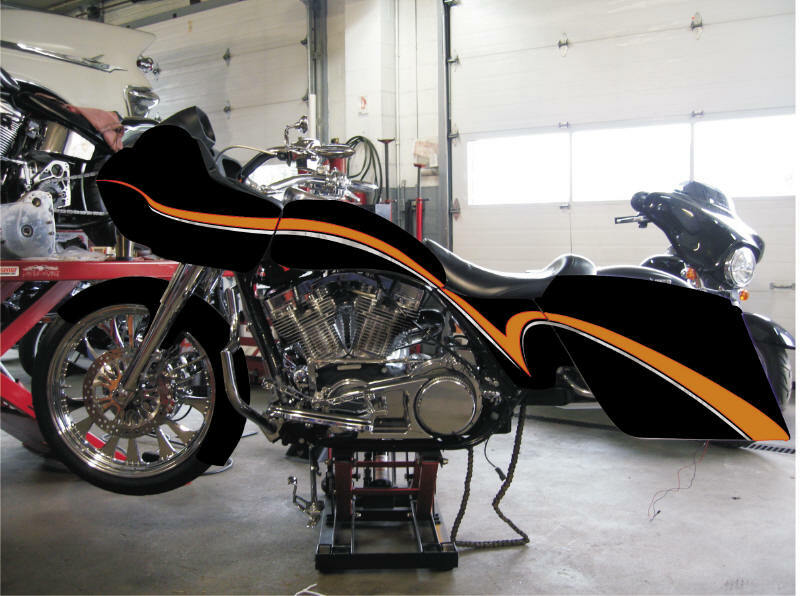 The bike was previously a Cinnamon Pearl and the owner wanted to incorporate that color, into the graphic. I outlined it in, what I imagined as, Gold Leaf. Next, I added a thinner line underneath, to fatten up the First graphic a little, and also give it an accent. I did that graphic in a Silver Leaf color. Then I tried some different outline colors. I then blacked out all the panels, as we knew the bike was going to be done in a Tuxedo Black. Now we could get a much better idea of what the finished product will look like. Finally, I tweaked the colors of the graphics. We have a wide Cinnamon graphic with a 14kt Gold Leaf pinstripe. Below that is a thinner Silver Leaf graphic with a Red pinstripe. Last, but not least, the real deal. From Concept to Reality ! While I was at it, some other two-tone combinations came to mind, so I thought I'd put those to paper. 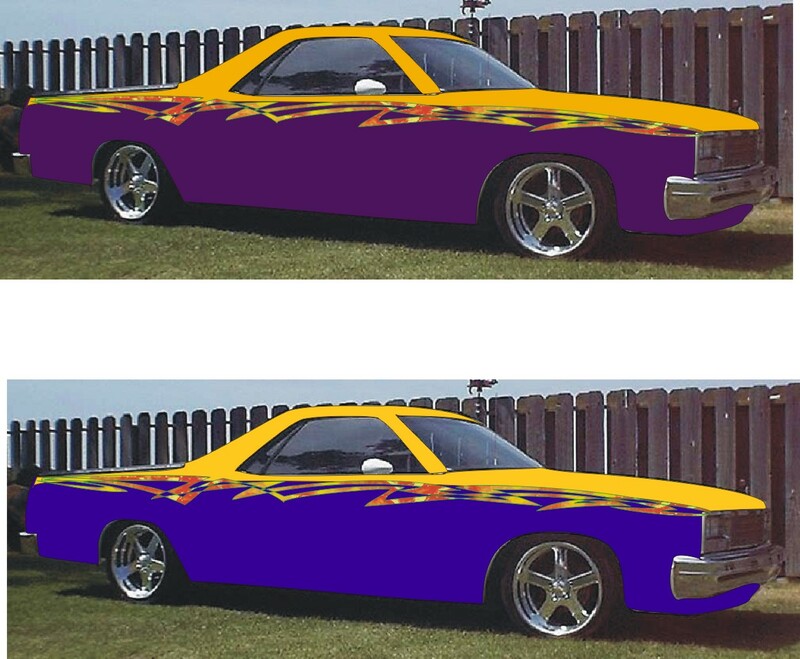 This is also how I developed, the idea for the paint scheme, on my ElCamino.Starting with a blank canvas, which consisted of a photo of an ElCamino that sat right and had similar wheels to what I was thinkin. I knew the style of graphic I wanted. I also chose to do the graphic in, Varigated Red, Gold Leaf. I had a good idea of the color combination already, but I wanted to see it first. 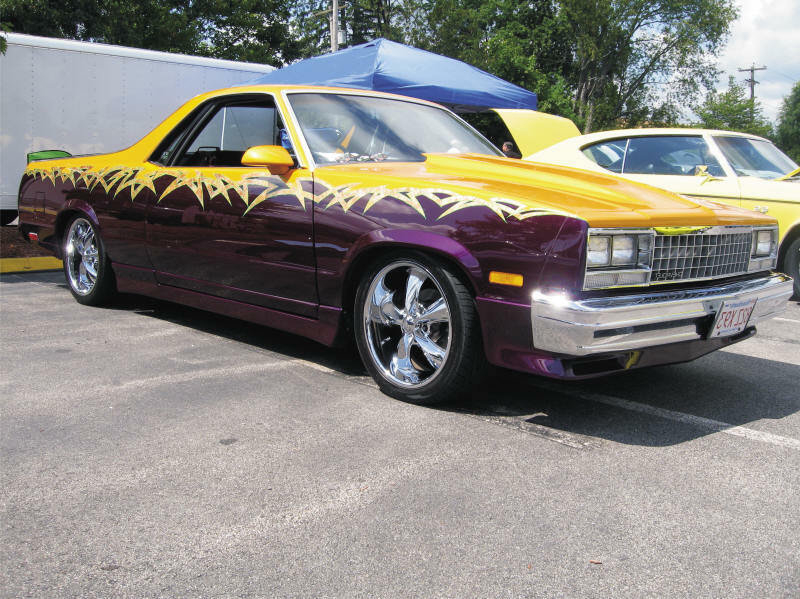 This kind of paint job, on a car, will cost about $1800 for the materials, and take about 200 hrs. It's not the kinda' thing you want to have to redo. So I experimented with some different combinations. But in the end , what was in my head, is what I painted. But I got to see it , with my own two eyes, first !